Sign up to attend one of GRCB’s summer sessions! Get involved by volunteering for our GRCB Summer Sessions! Learn about all of the ways you can get involved and support GRCB year round! Help us continue to create space where youth can sing out, speak up, and make noise! 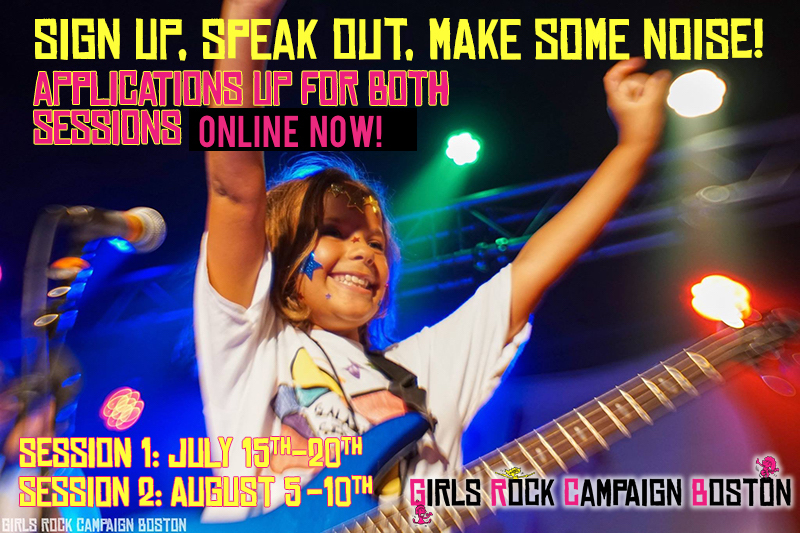 Girls Rock Campaign Boston empowers girls to believe in themselves by providing a supportive community that fosters self-expression, confidence and collaboration through music education and performance. GRCB's programs are about way more than just rocking out! Music education is only one piece of the GRCB mission. At GRCB, music education and performance provide an interactive, hands-on approach to teaching abstract skills like confidence and persistence. By providing opportunities to build musical skills, find and trust their voices, forge positive relationships with peers and mentors, and uncover their potential, GRCB’s programs have transformed the lives of over 600 of Boston area youth since 2010. What the youth accomplish musically in a 5-day period is remarkable on its own, but the impact of participating in GRCB goes beyond simply receiving music education. We use music and performance as a vehicle to eradicate limiting myths about gender in our society. We create space where girls are encouraged to sing out, speak up, and make a lot of noise. As one of the few organizations providing creative/musical opportunities focusing on the empowerment of girls and community building, GRCB fills an important niche in Greater Boston. The percentage of girls who agreed or strongly agreed to the statement, “I have good ideas” increased from 73% to 95%. We have debuted 224 all-female bands on stages in the Greater Boston area. My wife and I can say wholeheartedly that our daughter has never evolved so positively from any one program or group such as GRCB. [She] started the week as a girl who would lip sync her way through class performances, and hide behind curtains at school plays. Now she’s doing drum solos in music halls. We would love for her to be a life long musician, but the most important thing is that she becomes a confident, strong, compassionate woman in the future. GRCB showed her exactly how to be just that. We love you guys! When I was behind my [drum] kit, I could see at least 200 people there. I couldn’t stop staring at the crowd. I was so terrified that my arms were spaghetti. Then I counted everybody off and we started. As the crowd got louder, my confidence grew stronger. Then when we were done, I felt so good I could do it again. In this experience, I have learned that girls can do whatever they want. They are like a rock. Nothing could replace them. They are confident even when they don’t show it. Even if they are put down, they will stand back up taller like a skyscraper. They shouldn’t be afraid to try something different. My daughter attended the second session this summer and she was definitely EMPOWERED. [She] is shy or better accurately stated – painfully shy. So, I was a little worried when she chose to do vocals. But, when I saw her on the Brighton Music Hall stage singing loud and proud, my worries were laid to rest. Because of you, [she] was able to stand on that stage and do something she never thought she would be able to do. But, now, she too is a BELIEVER! Applications for GRCB Summer Sessions are now available! Sign up to VOLUNTEER, INTERN or ROCK today!